Today is the 34th anniversary of Bobby Nystrom's famous goal to win the Islanders' first Stanley Cup. I was 16 that beautiful May afternoon, and I was still about 20 months away from starting my long-term role as the Islanders TV statistician. But that doesn't mean I wasn't already in training. 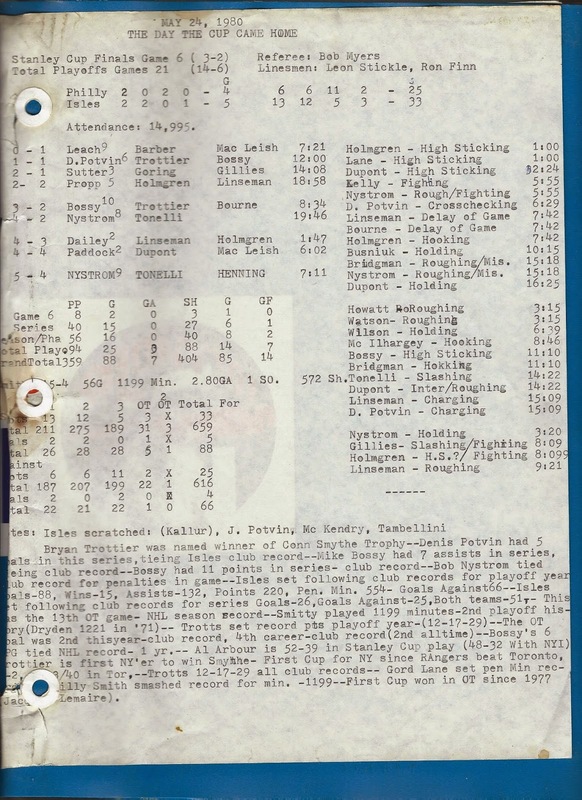 1979-80 was the first season that I kept a complete box score of every game -- and the minutiae contained in there is very similar to some of the things that make The Skinny on a nightly basis. At exactly 5:40pm on Saturday, May 24, 1980 Long Island became the center of the hockey universe as the Islanders won the Stanley Cup. ""Henning at his own blue line...shoots it up ice to Tonelli. Tonelli on the off wing ...comes in front.. the shot to Nystrom,,,SCORE!!!!! Islanders win the Stanley Cup! Islanders win the Stanley Cup! Bobby Nystrom with the goal...from John Tonelli...and the Islanders have won the Stanley Cup!....The Islanders have taken 7 years, 352 days, 17 hours and 33 minutes, but they have finally won the Stanley Cup." And now a sobering thought -- unless Jaroslav Halak leads the Islanders into the Conference Finals, by the time the 35th anniversary arrives, the Islanders will no longer be Long Island's team.